Hey, I'm not a big horse racing fan but I can certainly appreciate a winner when I see one. That Horse Smarty Pants is one race away from making history. I know there's a bunch of you who follow horse racing out there and I'm sure you're all buzzing after Smarty's BIG Preakness Victory. We'll be rooting for Smarty in a few weeks when he's looking to take the Triple Crown of Horse Racing. How about the awesome summer day we had on Saturday? Whoa! It truly felt like summer. Standing at the Wall watching the groms surf the 2' clean swell and seeing everyone hanging out in their beach gear was a familiar scene. I saw people in the water in just their trunks! In fact, Matt Evans was out longboarding in just his trunks! Come on. Just because the air temp is 90 plus degrees don't tell me the water warmed up that much...one thing's for sure-Summer's back! This week's photos of the week are of the timeless origin. The tube ride and the bottom turn. From 1974 to 2004 not much has changed in the actual manuever, but alot has changed in the technology of both board and wetsuit. And I say...Thank God for that! That's it for this week kids. Keep sending those pics (just make sure they are not HUGE FILES). I'm really looking for some old New Hampshire stuff if anyone has any. 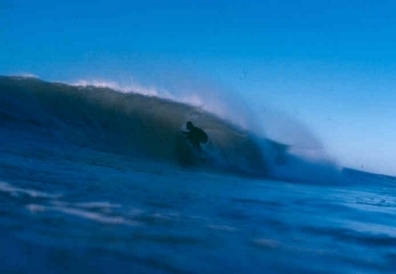 This is a 1973 photo of an old friend.The unique thing about this photo is the simple fact that getting "Barreled" or getting "Tubed" is really a timeless position. This shot could of easily been taken this year. Ever since the first "real" shortboard was introduced and "real" barrel riding started showing up in the mags and movies, the actual act of crouching under a pitching lip has changed very little. 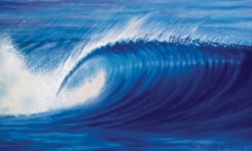 Of course, the Exceptional Hot Surfers of today, have taken barrel riding way deeper into the pit and stay in way longer than they did back in the 70's and 80's. Still, for the average bloke (like most of us) it's timeless. So the next time it's hollow, bend over and get inside...cause you never know who's got a camera trained on you. This photo of Mike Keefe was taken this last February in Costa Rica. Another timeless photo. Look at this photo. 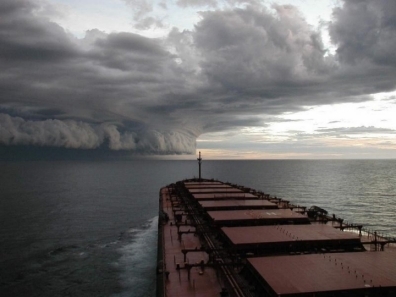 Imagine what the crew on this tanker is feeling heading straight into this Massive Cyclone! Hold on to yer seats kids! It's about to get bumpy!